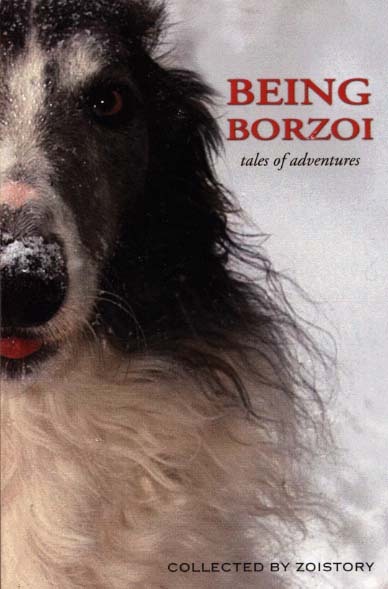 Over the years I have participated in the Borzoi News and Show Borzoi email lists, there have been many wonderful first person stories from List members, sharing their daily adventures with their Borzoi. Some have been hilariously funny, others sad and touching, but all have displayed the true essence of our wonderful breed. The writers paint such wonderful pctures of their hounds that I frequently said to myself; "I can just see it!" What followed last fall was my observation on the lists that we should compile these tales into a book for everyone to enjoy. To my amazement and delight, up stepped several people saying that if I would like to do this project, they would be pleased to assist. Thus Being Borzoi was born. The may who have leant their expertise to the various tasks are so talented and knowledgeable that each has contributed significantly. New friendships have been born of this collaboration, and we have become a family of Borzoi friends. We have been overwhzelmed with the grat response from readers with stories and pictures along with enthusiasm and the good wishes of Borzoi lovers from around the world. We, who have come together to create this book, hope dog lovers everywhere will enjoy our collection of anecdotes, tales, stories, and pictures. If some of the stories bring a tear to your eye, or a smile to your lips, our goal has been achieved, as wehave been able to portray the Borzoi in all their guises. May you recognize the love, humor, faithfulness, an mischief as they come together in one lovely package. Then you will agree we have created an image that truly reveals the essence of Being Borzoi.